The Supreme Court of India on Monday decided to choose ex- CBI Special Director ML Sharma assist the Central Vigilance Commission (CVC) in its probe against Ranjit Sinha, who during his tenure as the agency chief, was accused of ruining the probe in the coal block allocation scam.The suggestion to include Sharma on the board, subject to his consent, for inquiry against Sinha by the CVC came from a bench headed by Justice MB Lokur after CVC said it did not have its own investigating arm.The NGO Common Cause had sought investigation by Special Investigation Team on alleged scuttling of the probe into coal block allocation scam by Sinha. The bench, also comprising Kurien Joseph, which is monitoring the probe, had sought the CVC's assistance to determine the methodology for conducting such an inquiry on whether his meetings with the accused had any impact on the investigations, the subsequent charge sheets or closure reports filed by the CBI. The bench on 14 May had reprimanded Sinha for his "completely inappropriate" meetings with coal scam accused in the absence of investigating officers (IOs) and had said "further inquiry is necessary" to ascertain the fairness and effect of his conduct in the coal scam probe. Attorney General Mukul Rohatgi submitted that since the CVC did not have its own investigating arm, the investigators from the CBI and Enforcement Directorate, who are not associated with coal cases, can be asked to assist the anti-corruption watchdog. At this juncture, the bench suggested the name of Sharma saying that he was an "outstanding officer" who enjoys "good reputation and can be asked to have officers, either in service or retired, on whom he has confidence to be in his team to assist the CVC. "If Sharma has no objection, ask him to give 3 or 4 names of officers who can assist him," the bench told Rohatgi. The Attorney General said he would inform the bench of the outcome of his communication with Sharma. The bench said if Sharma did not agree with the assignment, the top law officer would suggest names of some others. 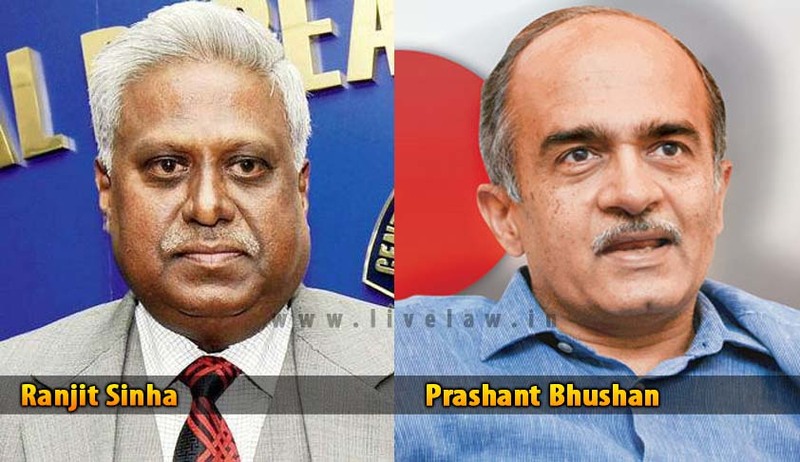 During the hearing, advocate Prashant Bhushan had also recommended the name of Justice N Santosh Hegde, former apex court judge, saying he was a former Lokayukta of Karnataka and has experience in conducting inquiry. The Supreme Court in its ruling had said even if Sinha is right, there cannot at all be any justification for him to meet any accused person in a criminal case where investigation is underway, without the investigating officer being present, whether it is in his office or as alleged by Prashant Bhushan, at his residence and that too, allegedly, several times including late at night. The bench, which took cognizance of the fact that Sinha met several accused including Rajya Sabha MP and industrialist Vijay Darda, said it is not necessary to examine whether the probe into the case of the Dardas was in any manner influenced by him at any point of time. "This is all the more so if we keep in mind the fact that in the 2G scam investigations, this Court had concluded in its order of November 20, 2014 that Sinha should not interfere in the investigation and prosecution of the case relating to the 2G spectrum allocation and to recuse himself from the case. That an SIT was not ordered in the 2G spectrum case is not relevant," the bench had said.